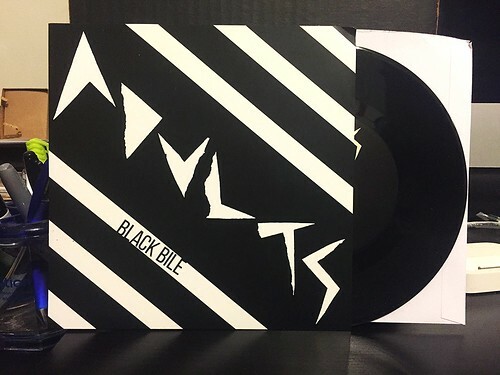 I Buy Way Too Many Records Dot Com: Advlts - Black Bile 7"
I wonder what band really started the thing where they replace the "u" in their name with a "v." I feel like I've been seeing it a lot over the past few years and it always strikes me as weird. That being said, I try not to judge bands too harshly on their name. After all, I do own 4 Goober Patrol albums. Advlts have managed to cram six songs onto this 7" with the longest one coming in at a tidy one minute and thirty-three seconds. Usually when I see times like that, I tend to go running for the hills assuming it's going to be a hyper fast, shouting mess. Amazingly, Advlts aren't like that at all. The songs are short and I'd even go as far as to say they have a pretty quick tempo, but from there everything defies expectations. The guitars have quite a bit of restraint on them, eschewing crazy fuzzed chaos for a warmer, slightly jangly tone. The vocals are urgent, but never screamed and maintain a level of melody that many bands trying this sort of thing would find difficult to pull off. These songs mostly remind me of the sort of thing you'd find on a random 7" put out by Lookout in the late 80's or really early 90's. I won't go so far as to say I love this and expect to play it constantly, but I did end up liking it quite a bit more than I expected.